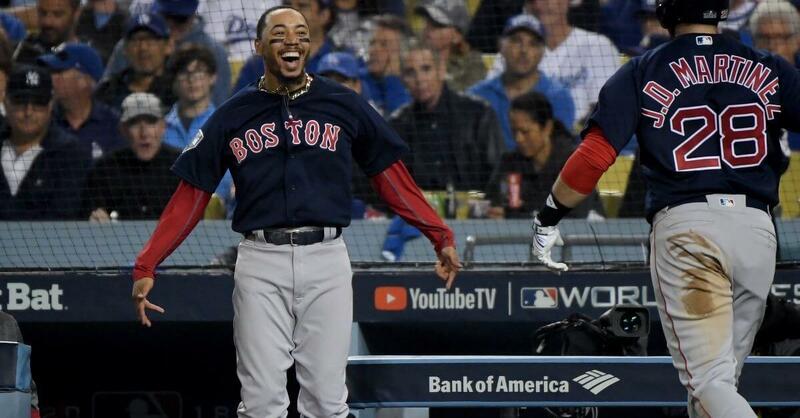 Boston Red Sox all-star outfielder Mookie Betts had himself quite the week, including taking the time to feed the homeless after Game 2 of the World Series. Mookie spent Halloween celebrating Boston's World Series title at their victory parade in downtown Boston. On Sunday, he hit a home run to help his team clinch the title in a 5-1 victory. Four days prior to that, the MVP candidate had three hits in a Game 2 win and then spent the night feeding the homeless in Boston. 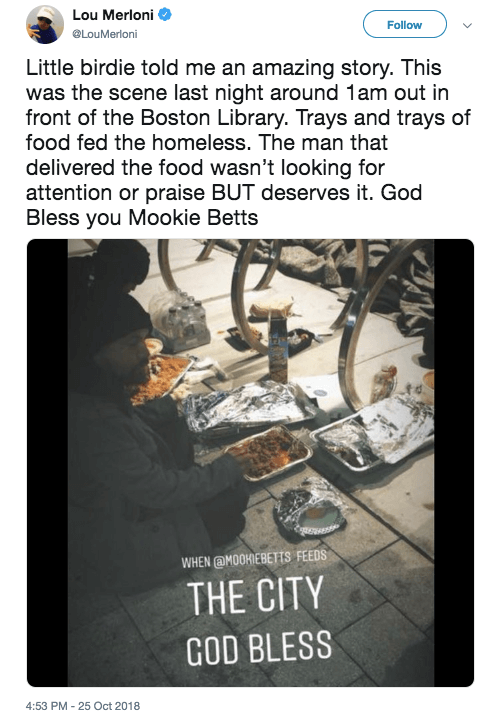 At about 1:45 AM, hours after the game had ended, Betts was spotted with his cousin handing out trays of hot food to the homeless sitting outside the Boston Public Library. Recalled Mike Winter who spotted the pair, "I didn’t know who they were at first. They had hoodies on. Next thing I know, they are laying out trays of food. Then they’re walking around all of Boston library where there are tons of homeless and telling people there is food around the corner." Betts and his cousin walked away without stopping for a photo op or any recognition. Winter said, "You see a lot of celebrities do stuff for recognition but the fact was he was trying to stay totally on the down-low. He wasn’t out looking for any recognition all." Betts himself was surprised anyone made a big deal about the gesture. "I've been blessed with everything I have, and I might as well share it. It's not the first time I've done it," he added. "It wasn't supposed to get [the attention] it got." If this wasn't cool enough, Betts also won the entire country free tacos. What a week.